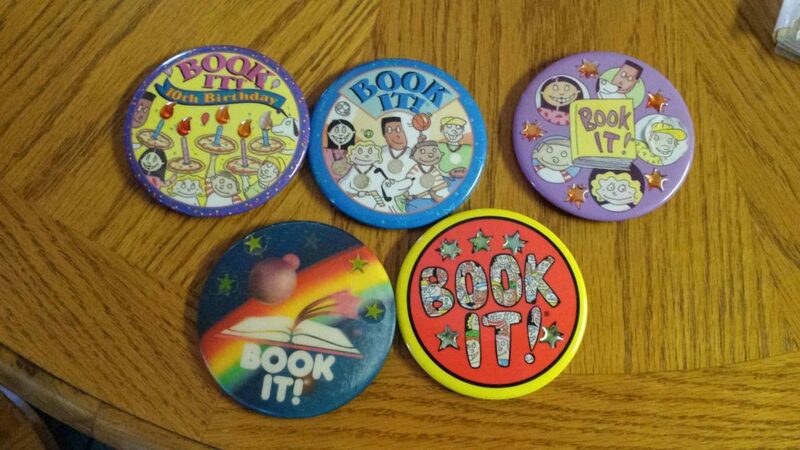 For those of you who were less interested in cheese, toppings and Judy Blume in the 1980s and 1990s, the Book It! program was an initiative started by the pizza juggernaut to encourage elementary-school age kids to read more. The way it worked was simple: read to complete a certificate, get a sticker and fill up your button, then redeem it for a free, one-topping Personal Pan Pizza® from Pizza Hut. As a kid growing up in Georgia and later Texas, the program not only introduced me to loads of Choose Your Own Adventure books, it was a great chance when we could eat out at a restaurant. It also helped spark my lifelong love of reading. See my favorite books and book-related blog posts here. All of this flashed before me as I sat alongside Bud Gates at that dinner at the Wichita Art Museum. I knew I had to find out; where did Book It! come from and what made it brilliant? THE STRANGE ORIGINS OF BOOK IT! To see where chain restaurant literacy began, one must look to another megabrand: Pepsi. Pepsi! My father was a decidedly Pepsi guy, and so I grew up in a Pepsi household. Company lore has it that Pizza Hut began with two brothers, Frank and Dan Carney, borrowing $600 from their mom to start a pizzeria in Wichita, Kansas. The first Pizza Hut opened its doors in 1958 and the first franchised location opened two years later in Topeka. In 1977, PepsiCo bought Pizza Hut, further marrying their food and beverage empire. PepsiCo owned a bunch of brands at the time, including Wilson Sporting Goods, Yum Brands, KFC, Taco Bell, Pizza Hut, Frito Lay, and Mug Root Beer. Gates joined Pizza Hut in March 1979 via a successful career at Wilson Sporting Goods. Upon moving to Wichita, he quickly befriended Art Gunther, the company’s president. Gates and Gunther and their wives were out to dinner one night and talked about the Gunthers’s son who had struggled with learning to read. Gates and Gunther began to wonder; what would happen if they gave kids pizza as a reading reward? The hope was that they would bring their hungry and thirsty parents, too. Then, they brainstormed more: What if we got schools to do it, then we got the whole class to it do it, thus adding peer pressure? If everyone participated, then the whole class could get a pizza party. A new generation of pizza marketing was born. Within 11 months of launching, more than 7 million children were using the program in 233,080 classrooms across the nation. Writing about it around its launch in 1985, the Los Angeles Times praised its simplicity and effectiveness. The program married Reagan-era private funds with a desire to improve literacy. Reagan himself even wrote to Gates and his compatriots to congratulate them on Book It!’s success. “I salute you,” he said. Bud told me that a woman named Phyllis became in charge of the program, drawing on her critical experience as a librarian and working with schools. Among the innovative approaches she spearheaded was allowing kids to be rewarded for either minutes spent reading or per book, therefore not punishing slower readers or those learning English as a second language. In its own strange way, Book It! impacted public policy in America. In 1989, National Young Readers Day was established with the help of Pizza Hut and the Center for the Book in The Library of Congress. Nor was Book It! limited to analog fun; in 1997, the initiative announced its presence on the Information Superhighway. The program has also joined forces with the U.S. Department of Education to promote summertime reading, lest students get slothful in the off-school months. When Hurricanes Rita and Katrina struck in 2005, more than 250,000 books were donated to victims through the program. Since its inception more than thirty years ago, today the company says that Book It! reaches more than 14 million students and 37,000 K-6 grade schools. The program has even been studied by academics and found to be effective in its offering external motivation (pizza) for kids to read. Celebrities ranging from John Lithgow to Justin Bieber to Tim Tebow have signed on to read for Book It’s America’s Biggest Bedtime Story. And in the ultimate mark of millennial nostalgia, Urban Outfitters has requested the rights to use the original Book It! logo on its wares. Meeting Bud Gates and thinking about my childhood enthusiasm for Book It! made me appreciate where my regular book readings habits came from, but also lament that so many of us still don’t read enough books as we want to. In an effort to recreate the Book It! Culture for grownups, I offer up a challenge. Take a selfie with the last book you finished and tag me @nickgraynews on Instagram. For each of the first 20 tags, I’ll make a $50 contribution to the New York Public Library. Here are some book-related links that I love to help your launch your Book It! 2.0 journey. And the next time you’re in Wichita and meet a guy named Bud, be sure to throw him a thank you. BONUS VIDEO: THE HISTORY of BOOK IT!